Delivering consistent, robust transgene expression, the AAVS1 safe harbor site is a preferred target for gene knock-ins. Insertion at the site has been shown to be safe with no phenotypic effects reported, and the surrounding DNA appears to be kept in an open confirmation, enabling stable expression of a variety of transgenes. 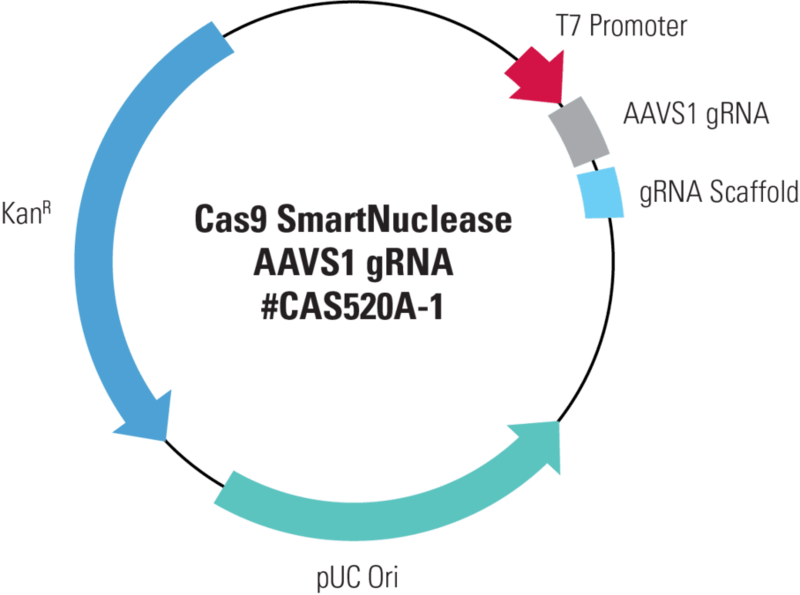 The Cas9 SmartNuclease™ AAVS1 gRNA is a pre-built, transfection-ready gRNA that targets Cas9 activity to the AAVS1 Safe Harbor Site. Co-transfect the Cas9 SmartNuclease AAVS1 gRNA with any of our transfection-ready hspCas9 SmartNuclease mRNAs and an appropriate homologous recombination (HR) targeting vector for gene knock-ins, reporter cell line construction, or any other application where you’d like to take advantage of the AAVS1 Safe Harbor Site. Or contact our technical support team for immediate answers to your specific questions—email tech@systembio.com. Figure 1. Cas9 SmartNuclease AAVS1 gRNA directs Cas9 activity to the AAVS1 site to knock-in GFP. METHODS: The Cas9 SmartNuclease AAVS1 gRNA was co-transfected with the Cas9 synthetic mRNA in combination with an AAVS1 HR Targeting Vector harboring a GFP marker. The activities of the Cas9 mRNA + AAVS1 gRNA transfection was compared with that of the EF1 Cas9 SmartNuclease-AAVS1 gRNA All-in-one vector system. Cells were imaged for GFP fluorescence after 3 days.